How it works and why it's a must on-board! The NMEA network protocol was developed in the 1980s by the National Marine Electronics Association, with the aim of creating a uniform standard for data transmission between devices of different types and from different manufacturers. With it, GPS, wind, depth, AIS, speed, engine & compass data can be exchanged between, for example Simrad, Garmin and Raymarine devices. An NMEA2000 interface is required to do so. Images, such as from radar and fishfinder, as well as map content, cannot be transmitted via the NMEA2000 protocol. Everything needed to create an NMEA2000 network can be found in our category Network. The NMEA0180 protocol was first introduced as a standard in 1980 and in the following years it was further developed into the NMEA0183 protocol. Since then, the NMEA2000 system has become the standard for marine networks, with many current devices using it. In an NMEA2000 network, data is transmitted via a so-called Controller Area Network (CAN Bus). The CAN bus system simplifies installation and transmits the data to all devices in the network. Typical NMEA2000 devices include wind sensors, GPS antennas, AIS devices, speed and depth sensors, multifunction displays, instruments and autopilots. NMEA2000 is also commonly referred to as N2K. Furthermore, the system has brand specific names, such as SeaTalkNG (Raymarine) or Simnet (Simrad). The backbone is the master cable of the NMEA2000 network, which runs horizontally through the ship, parallel to the keel. 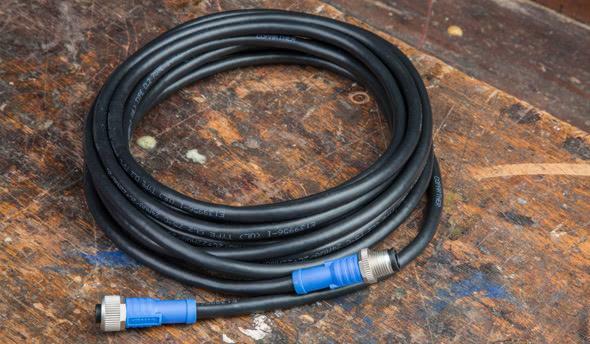 This master cable can consist of single T-pieces, multiple distributers or a combination of both. The T-pieces and multiple distributers can either be connected directly to each other or via a network cable. The length of a backbone could thus reach up to 200m from bow to stern, depending on the type of cable. The backbone transmits all data to the devices in the network. The NMEA2000 backbone must be closed with two terminal resistors. Some devices, such as wind sensors, may have an integrated terminal resistor. These sensors should be connected to one end of the backbone, if possible. In this case, only one terminal resistor is required for the other end. 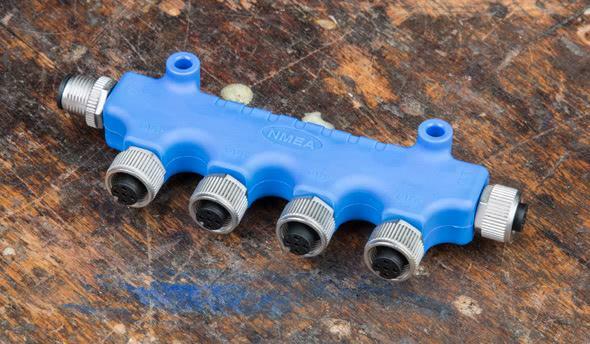 In order to keep the NMEA2000 network watertight on the side with the integrated terminating resistor, a so-called dummy cap can be used. Line cables, or drop cables, are used to connect individual end devices to the backbone. With them, information from sensors and transmitters can be sent into the network or it can be retrieved from the network by multifunction displays and other displays. An NMEA2000 network requires an own power supply for connected sensors and instruments. Networks may only be supplied on a 12V voltage basis. Our starter kits contain a corresponding power cable for the power supply. Up to 50 devices can be integrated into the NMEA2000 network via the backbone. Smaller connected instrument displays receive 12V power from the NMEA2000 network. Larger devices, such as multifunction displays or autopilots, require their own power supply. Multifunction displays receive information from the NMEA2000 network. Transducers, as well as small displays receive power from the NMEA2000 network. Transducers supply information to the NMEA2000 network, which is then used by the multifunction displays and displays installed in the network. For information on selecting and installing transducers, please refer to our Transducer Guide. When setting up a new NMEA2000 network, we recommend one of our starter kits, which may vary from manufacturer to manufacturer. These kits contain all the necessary components to connect two NMEA2000 devices with each other. The starter kits can be extended with cables, T-pieces and multiple distributers. Our NMEA2000 products are certified to meet the strict requirements of the National Marine Electronics Association. Products described simply as NMEA2000 compliant do not meet the technical and qualitative requirements of the NMEA2000 standard and individual network components may not function reliably in this case. You should plan the constellation of your network so that you can integrate additional devices into it at any time, for example by adding a T-piece. Before connecting new devices, disconnect the network from the power supply. Then simply unscrew the terminal resistor and add another T-piece or a multiple distributor that the new device will be connected to. You then only need to screw on the terminal resistor again and turn the power supply back on. 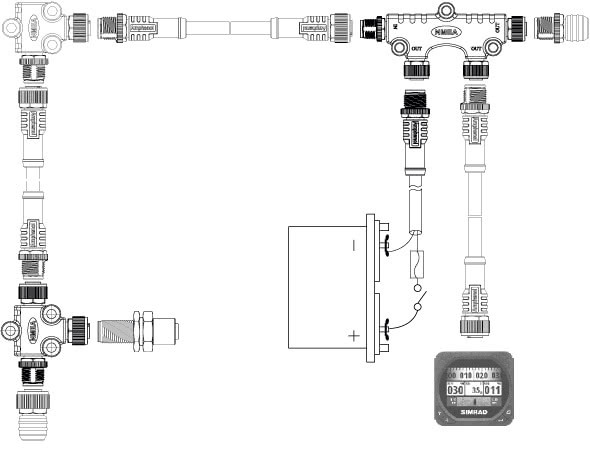 Our SVB electronics specialist explains this step in detail in our NMEA2000 video tutorial. The abbreviation PNG stands for Parameter Group Number and is used to identify the NMEA2000 data sets. Before you connect two devices to an NMEA2000 network, you should check whether their PGN (data sets) are compatible. This information can usually be found in your product‘s respective operating instructions. When planning your network, make sure you keep in mind the maximum possible length of backbone cables. Assuming the voltage distribution is correct, the backbone or the master cable (depending on the type of cable) must not be longer than 200 m. In any case, make sure that the backbone is terminated at both ends with a terminal resistor. These are included in the starter kit. 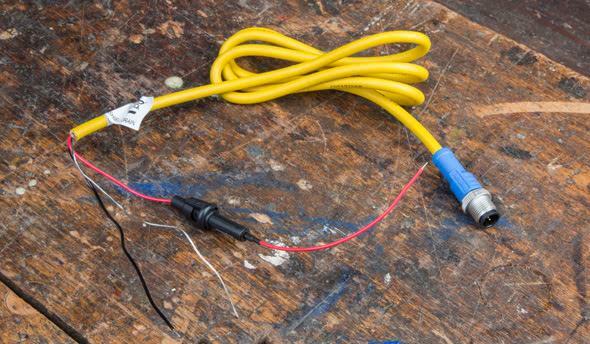 It is recommended to connect the NMEA2000 network power supply so that the network is evenly loaded. The best way to do this is to place the power supply in the middle of the network. An important term in this context is the so-called LEN value. LEN stands for Load Equivalency Number and refers to the load factor of a device in the network. This factor indicates how much power the device needs from the NMEA network and thus helps to calculate how many devices can be integrated into an NMEA2000 system, depending on the power requirements of the devices and the cable length of the network. The LEN is given as a whole number and provides a quick overview of the power distribution and helps to avoid unwanted voltage losses and resulting malfunctions in the backbone. One LEN is the equivalent of 50mA. The NMEA2000 standard defines the maximum load capacity of the backbone with 3 A (=60 LEN). Example: If a device draws 151mA current from the network, then its LEN = 4. The LEN is always rounded up to the next whole number and never rounded down! Connect your end devices to the backbone using a drop cable and a T-piece/multiple distributor. Observe the maximum cable length of 6m. Connects T-pieces, multiple splitters and end devices. The Micro-C version is a manufacturer-independent standard which is widely used on the market. 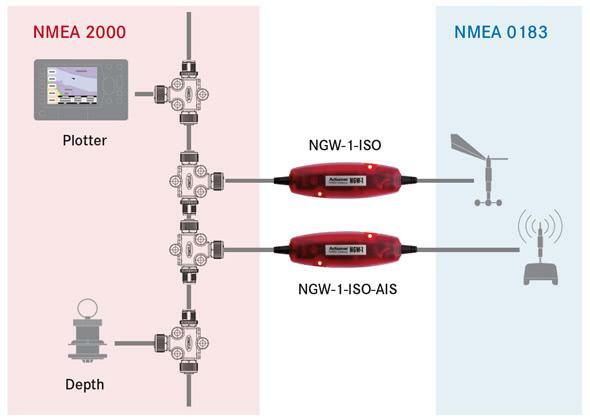 By standardizing the NMEA2000 network protocol, however, the cables and connectors of different manufacturers can be adapted in order to implement manufacturer-independent network connections. If you still have devices running on NMEA0183, we'd like to hear from you. 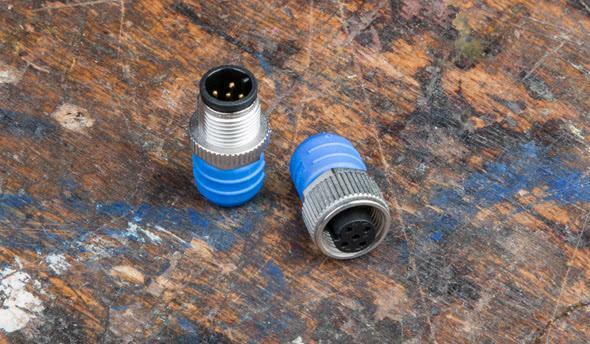 An active NMEA0183 to NMEA2000 converter is required to integrate these devices into an NMEA2000 network. Important: This converter must be ordered or configured depending on the baud rate of the NMEA0183 data reaching the converter. SeaTalk1 is a Raymarine network that was launched at the same time and is the equivalent to the NMEA0183 network. Raymarine devices with SeaTalk 1, such as ST40, ST60+, Raystar 125 GPS and Life Tag Man Overboard System, can be converted to SeaTalk NG using a converter kit, making them compatible with NMEA2000 networks.